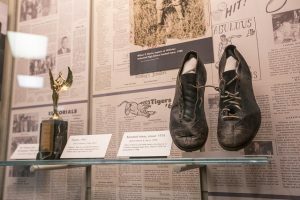 WILMINGTON, N.C.— Cape Fear Museum has added a new case of artifacts and images from the 1900s to 1970s to Williston Auditorium. The display highlights student life at Williston High School and will be rotated periodically to feature the varied experiences of Williston students and teachers. From academics and athletics to extracurricular activities and occupational trades, visitors can see the important ways the Williston experience has shaped our community. Funding for the enhancements was generously provided by the Williston Auditorium Endowment Fund. The Williston Alumni Association and Cape Fear Museum will celebrate the enhancements to Williston Auditorium with a public reception on Sunday, May 7, 2017 from 2:00 to 4:00 p.m. Refreshments will be provided and admission is free. Education in Wilmington has a long, rich tradition, and the name “Williston” has been associated with schooling in the area since the 1860s. What began as an American Missionary Association school became — between 1923 and the day it closed its doors in 1968 — the only high school for African Americans in New Hanover County.